Life at Work: Q29: What can great art teach us about listening? Q29: What can great art teach us about listening? click just below this line where it says 'comments', next to the envelope icon. That will take you to the comments box at the bottom of the post. Your browser needs to be set to accept cookies. looking at an engraving of a house, called it an ugly thing’. Composed Chiefly of His Letters (1843), (Phaidon, London, 1951), p. 280. Yet Turner (1775-1851) and Constable (1776-1837) lived in an age of poverty, disease, uncontrolled industrialisation and open sewers - they must have seen ugly things! Drawing of a Travelling Group of Poor Wretched Nineteenth-Century English Beggars. The image comes from the historical archives of LIFE Magazine. With his artist's eye, Constable sees things differently - as beautiful - because he knows how to see them. Revealed through light, shade and perspective, everything is worthy of attention. So it struck me, how can we take this into our everyday conversations? Could we listen with an 'artist's ear'? Can light, shade and perspective help us, too? Seeing Turner's sea pictures in the flesh at the exhibition, I'm immediately basking in myriad sources of light. Everything seems to reflect in everything else. 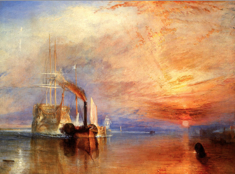 Sunset on the Sea, Turner, 1839 (in the Tate collection). What would happen if we listened in this way? For me, it means tuning into the light and life behind somebody's words; reminding myself that whatever goes on inside a person is reflected in their words, expressions, gestures and actions. In a painting, the light decides what catches your attention and your eye moves there naturally. As you listen, let the life behind the words catch your attention. If you focus on that, your understanding will move there too. Leonardo da Vinci said, 'Shade is a more powerful agent than light'. You can rob somebody of light by placing an obstacle in its way, but however much light you shine, you can never get rid of a shadow. It will only get stronger. This is like the conversation where the emotional undertow or the subtexts speak more loudly than the words themselves. However clear the words are, what is unclear obscures what is clear. But, as Leonardo points out, shadows are entirely necessary. Without them, 'the forms of bodies could not be understood in detail.' Unless we are open to people's shadowy messages as well as the clear ones, we won't be able to understand them in detail. Leonardo da Vinci (1452-1519) from Six Books on Light and Shade. In communication, half-hidden emotions and subtexts often get a bad press. We end up feeling confused, wondering what the other person really means. If you aren't clear what you mean, you draw me into an indistinct, fuzzy realm of semi-formed feelings and intentions. You cannot say them fully because you do not know them fully. But if I get irritated or upset, it will be even harder for you to work out what you want to say. If I feel overwhelmed by the unknown, I won't enjoy listening, and you won't enjoy talking. This is where listening becomes an art form! 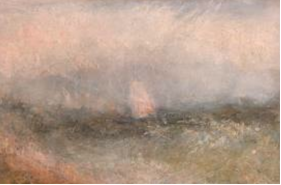 If we try to understand every shape and object in Turner's sea paintings, we miss the point. In his indistinct world, there are no precise forms. Yet he communicates powerful emotion and extraordinary atmosphere. Only when we see the hazy images as part of a whole, do we gather a sense of meaning, mystery and magic. (in the Yale Centre for British Art, Paul Mellon Collection). In great art, the forms may be blurred and indistinct - yet they evoke emotion, power and depth. As you listen, allow yourself to enter the world of the unknown. It's here you feel the force behind the words, a felt-sense which may not (yet) have words to do it justice. Taking light and shade together, an artist learns the skills of perspective. By accepting and including both, the scene gains depth and distance. Looking at it, you know where you stand. If you listen in this way, you accept and include what is 'good' and 'bad'. Even if my comments are 'ugly' - sharp or grumbling - you hear them differently. They take on depth and substance. You see other dimensions of me (and perhaps I do too). The more curious you are, the more fascinating I become! If you want to hear words as 'beautiful', listen like an artist. The artist's gift may be a blessing, but it is also a skill which grows through practice. Remember: there is magic and mystery in anyone's words, whatever they are! Why not share your ideas about listening by adding a comment to this post? What helps you to listen? Do you have any other metaphors or inspirations which help you to give space to yourself and to others? Really enjoyed your creative metaphor here - as a visual person, it helped me translate the skills that go with that to the realm of communication and listening. I find that connecting with silence in solitude helps me listen to others deeply. Thank you! Yes, I also enjoy connecting with something way beyond the words, in silence, in nature, in the beauty of a picture. It seems to make me more spacious and expansive, more able to take in everything inside me, and inside other people. I'm sure there is something particularly magical about silence, and your comment stimulates me to wonder more about this… Thank you! This post is in itself a wonderfully novel perspective on listening. As with all your blogs, I find it giving me a new resource for listening for the best in others. And I am also interested in the "magic and mystery" - I am always puzzling why these things matter to us so much. I realise I tend to be logical with my thinking and speaking while going all dreamy and unfocused when looking at a work of art. With the help of your observations I believe (experience will tell me!) I can have a warmer, richer and more expansive experience of listening and of looking by appreciating the hidden dimensions of both - such as the emotions behind the words and the specific techniques underlying the creation of a work of art. I was lucky enough to spend a long time in early April in Gaudi's extraordinary Familia Sagrada basilica in Barcelona. I believe architecture like this is the very embodiment of the full simultaneous expression of both the logical and the artistic. This is a lovely piece that you have both written. In the last training course that I ran (over two years), we looked at paintings and photographs, visited sculptures, listened to music, and shared poetry and stories. I feel that this is a natural approach to listening; and it sits better with me than a didactic or descriptive approach. If you enjoy these tips, why not tell a friend? I am publishing a book next year, and publishers like to know their authors have a wide network. I would be grateful for your support. Copyright © Life at Work | Life at Work Website. Simple theme. Powered by Blogger.